Hello everyone! 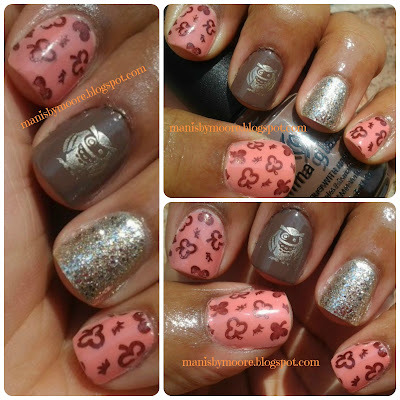 I have a cute little mani for you today! I have been wanting to use some of these owl designs. I think they are so cute! Every where you go they have owls on everything right now. Earrings, necklaces, shirts, bags. I think it is the cutes little mani! I fell in love with the pink/peach/coral color IV by China Glaze. It is sort of a jelly polish. I love the way it looks and I am so mad it took me so long to try it! What do you think of the whole owl trend?? Thanks for stopping by! I love your blog, keep up the great work! And the owl looks amazing, I love it! These look great -- that owl is amazing! I love owls! Thank you so much!! Such an honor! I do the same thing. I am very forgetful. Do not worry about it. LOL!